Adrenal patients need steroids just like diabetics need insulin, but awareness on adrenal disease is not as common as awareness on diabetes is. We’ve lost way too many in the adrenal community due to lack of steroids. It’s time the truth of adrenal disease was told and this foundation is doing all we can to advocate for all forms of adrenal disease! Upload your awareness photos to social media and use the hashtag #SteroidsSaveLives to help us raise awareness that steroid medications are necessary for life in those with adrenal insufficiency! We are going to END steroid shaming. We are going to spread the message that steroids are necessary for adrenal patients to live. No one should feel guilt for being on medications that keep them alive. It’s time the truth of adrenal disease was told! What is the Cortisol Pump? Basically, the cortisol pump is a repurposed insulin pump that delivers solu-cortef instead of insulin. The use of solu-cortef (injectable version of cortisol when mixed with saline) is placed in an insulin pump that is programmed to disperse cortisol according to circadian rhythm dosing by programming rates of basal delivery into the pump. The pump also has options to bolus for stress dosing. This helps adrenal patients maintain better control of their cortisol levels by allowing them to get cortisol quicker instead of waiting until steroid pills metabolize through the stomach and finally enter the bloodstream. This therapy bypasses the gastric system and is able to deliver cortisol in a more consistent way. With a pump, an adrenal insufficient patient can receive a constant supply of cortisol and will not suffer the ups and downs with oral cortisol replacement tablets. They are able to sleep through the night without having to wake up to take steroid pills. This can be of great benefit to adrenal patients who are hypermetabolizers of cortisol. Some patients have to take medications more frequently than others due to their body’s high cortisol clearance rate. The pump is a great asset to these patients because they are no longer forced to take pills every couple of hours around the clock. Side effects due to mal-absorption can be decreased and patients have been reported to have improved sleep, weight management, gastric issues and experience an overall improvement in their energy levels and sense of well-being as opposed to taking steroid tablets. Professor Hindmarsh, of CAHISUS is a pioneer for this life changing treatment. The pump is not a cure for adrenal disease and is difficult to obtain. This treatment is relatively an unknown in the United States and this foundation is actively working to raise awareness on this alternative treatment to managing adrenal insufficiency. It is a difficult process but it IS POSSIBLE! For more information please read our article on HOW TO GET ON THE CORTISOL PUMP. There are doctors in the USA who will manage this treatment and we hope to continue raising awareness so that one day it will be as available to adrenal patients as it is to diabetics. We’re here to lead all adrenal patients to every adrenal alternative! Step 1- Assess your life, health and disease management. The cortisol pump is not a cure for adrenal insufficiency and is not a treatment that is right for everyone. If you are well managed on the steroid replacement pills, the adrenal pump is excess money and effort you may not need. The pump is NOT an easy thing to acquire and the fight to get one takes a great deal of trouble, mental stamina and resources. You need to consider whether this is something you actually need or not. That being said, If you are struggling with your quality of life this treatment may help you. Step 2- Research, Learn and Educate for yourself! Adrenal insufficiency is a rare disease not widely understood in the medical community. You need to become an expert on your own health, especially if you are attempting to get on the pump. Most doctors barely know anything about adrenal disease. They have been taught that replacement therapy with pills is the only treatment and that patients live a normal life with this disease. You need to understand your specific health concerns. What is your diagnosis? Do you have primary Addison’s disease, secondary adrenal insufficiency, tertiary adrenal insufficiency or congenital adrenal hyperplasia? What is your quality of life? Are you able to work, drive, do housework or function normally? What have you tried to manage your adrenal disease? Typically an endocrinologist will not even consider the pump until you have tried EVERY oral steroid possible. What is your current daily dose of replacement steroid? How much are you stress dosing? Are you able to afford the supplies and medication needed for the pump? Insurance does not typically cover “off label” treatments. This disease is expensive and life threatening if left untreated. If you have A.I you HAVE to have some sort of steroid replacement to stay alive. Just educate yourself on everything you need to know. You will have to present YOUR case to an endocrinologist to get the cortisol pump. Which brings us to the next point. This will be a difficult part of your journey to the pump. Finding an endocrinologist that understands adrenal insufficiency is a needle in a haystack and then finding one who will be brave enough to attempt guiding you through pump therapy just adds to the challenge. Prepare the best case possible. Send your research, your health information, everything you can to the endocrinologist BEFORE your appointment so they are aware of your intentions before hand. Write a letter to the endocrinologist explaining diagnosis, failed treatments and desire to be on the pump. You will have to fight to find a doctor willing to write the script for the pump. It will take effort, lots of research and a mental stamina. Adrenal Insufficiency is documented to be treated by oral steroids and not by the insulin pump. Be prepared to be on the phone for hours and be told incorrect information. Just be aware that you will have to tell the same story to a different agent over and over and over again. Don’t give up. If your insurance cooperates and provides you with a pump and supplies, GREAT! But I’m pretty sure with A.I it won’t be that easy. Take heart, there are other options. There are many ways to obtain a pump and supplies: Diabetic Barter Sites, Facebook Groups, Craigslist and Ebay. The internet is a plethora of connectivity. You can find what you need, you just have to put in the effort to look. If you are not doing well on pills, switching to subcutaneous injections of solu-cortef may be an option while you are waiting. To figure out your dose, You need to convert it from oral milligrams to liquid solu-cortef. 2 units= 1mg if you are doing a 2:1 ratio with actovials of solucortef. You can also run a 1:1 ratio with 1ML of saline per 100mg of solucortef powder vials. You also need to dose according to the circadian rhythm percentages. Use solu cortef solution and inject with insulin needles. The standard recommendation is to have lab testing to see how quickly you absorb and “use” the cortisol in your body. You can have cortisol clearance testing done but it is not typically covered by insurance. It is beneficial to creating proper rates for your specific needs. A pump is only as good as the information programmed into it. The process to get on the pump is long, obnoxious and detailed. No one should have to fight for years to get better quality of life. The healthcare system is broken and changes need to made. This stands for all diseases and treatments, not just adrenal disease. Everyone should have access to a better life. Take heart friends, Our voices will be heard. 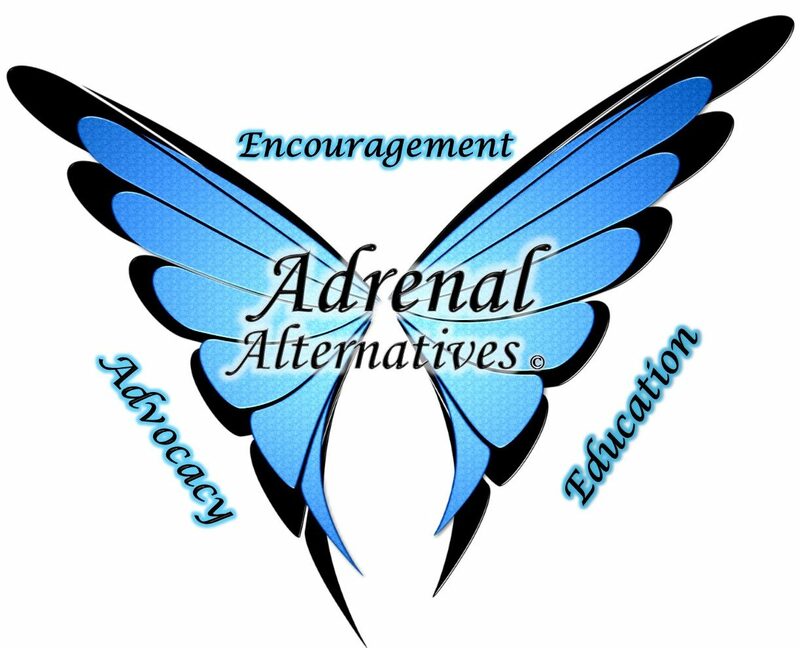 This foundation is dedicated to adrenal disease advocacy. This was written by an Addison’s disease patient and is not intended to diagnose or treat any medical condition. Consult your health care provider before starting or stopping any medical treatment. Medication used as partial replacement therapy for adrenocortical insufficiency and for the treatment of salt-losing adrenogenital syndrome. May also be used for treatment of POTS syndrome. A potent mineralocorticoid medication used to replace aldosterone in adrenal insufficiency and salt wasting syndromes. A class of steroid hormones produced in the adrenal cortex and influence salt and water balances in the body. The main mineralcorticoid is aldosterone. Aldosterone affects the body’s ability to regulate blood pressure. It sends the signals to the kidney to regulate the amount of sodium the body sends into the bloodstream or the amount of potassium released in the urine. It causes the bloodstream to re-absorb water with the sodium to increase blood volume. Aldosterone also helps maintain the blood’s pH and electrolyte levels. Aldosterone is closely linked to two other hormones: renin and angiotensin, which create the renin-angiotensin-aldosterone system. It is essential in regulating proper blood pressure and electrolyte balance in the body. An enzyme secreted by the kidney that is part of a physiological system that regulates blood pressure. In the blood, renin acts on a protein known as angiotensinogen, resulting in the release of angiotensin I. A group of hormones that are part of the renin-angiotensin system. To create angiotensin, the liver creates a protein called angiotensinogen. This protein is broken up by renin, which comes from the kidney. This forms angiotensin I. Angiotensin I passes through the bloodstream, where it turns into angiotensin II, which is the primary form of the hormone that affects blood pressure and other areas of the body. Simply put- Proper aldosterone levels are essential to the synergy of chemicals in the body. In adrenal insufficient patients- fludrocortisone is used to synthetically balance electrolytes and blood pressure levels. With any other steroid medication, general recommendations are to start out on the lowest dose possible and adjust according to blood renin levels and electrolyte levels determined through a blood metabolic panel lab result. Fludrocortisone is a potent medication that directly affects cardiac function. Too high of a dose can lead to high blood pressure, stroke, swelling, weight gain and mental disturbances. Be vigilant of any changes your body is presenting and contact your doctor if you exhibit any of these issues. At first, I felt super happy. My anxiety had decreased, I felt less “sick,” I had more energy and felt somewhat normal again. I had a euphoria that felt almost as if I was “high on life.” What I didn’t realize is that Hydrocortisone actually does affect the areas of the brain that manages the regulation of serotonin and dopamine, the “feel-good” hormones. Feeling happy is a great side effect to have. However, as time went on, other psychological side effects popped up that were not only startling but also very scary. And what scares me even more is the fact that not one doctor that I have seen, both in the hospital and out of the hospital, since being on corticosteroids, has told me that there are mental side effects of being on them. Not to completely pass blame to doctors, as I think a lot of it has to do with lack of knowledge. I literally would sleep for 20 plus hours a day, only really waking up to take my medications and sometimes eat food. When I was awake, I was full of anxiety and depression. I not only was terrified of talking to people, going places, but I was convinced that I was dying. Thankfully, I was never suicidal, although I have read about people becoming suicidal, as another mental side effect. Because we are so wired to listen to doctors, the advice of just “riding it out” was what my husband did. I wish I could say that was the last time I experienced any kind of mental side effects from the steroids. Unfortunately, I have had my share of them…. Having Adrenal Insufficiency is a very difficult disease to manage for most people. Just when you “think” you know everything there is to know, something will pop up, leaving you questioning everything you know about it. Like I said, I recently was researching the psychological side effects of corticosteroid use. I definitely “knew” that there was a connection, but honestly only thought about the temporary psychosis part being an issue. After that episode of temporary psychosis, I still had side effects…I just didn’t link them to the steroids. Awareness about invisible illness is something that this foundation is incredibly passionate about. Those who suffer with diseases and conditions that cannot be seen are scrutinized by those who simply do not understand. Conditions like Addison’s, Cushing’s and most adrenal diseases cannot be seen by the human eye but effect the lives of so many sufferers. Which is worse; Looking well but being sick- therefore having people assume you are lazy and unmotivated OR being sick and looking sick and having people stare at you in confusion; knowing something is wrong but not having the compassion to understand? My illness took on a physical form after my diagnosis of adrenal disease. My body now bears the exacerbation and side effects of poor steroid absorption. Before I was on the cortisol pump I was on steroid tablets, which I did not absorb and got very sick. My once clear, ivory skin now bears the unfortunate appearance of acne, my figure is now in double digits instead of the quaint size “8” I formerly was and my body bears the bright purple/red stretch marks and scars resulting from my surgery and the mismanaged cortisol medication. Most of us with adrenal disease have struggled with our looks. Before my diagnosis, I was 87 lbs at 5’4….then four years later before the pump I ballooned to an obese size. But you know what? My heart remains the same. The only size that should matter is the size of your heart. If you are struggling with self acceptance, please reach out to us, we have counselors available to help you! Cushing’s Disease- A rare condition that is the result of too much cortisol production in the body. One source of Cushings is when the adrenal glands have a tumor; making too much cortisol. Another cause of Cushing’s syndrome is when the body makes too much of the hormone ACTH; which causes the adrenal glands to make cortisol.